This six-year old is brain damaged, partially sighted and deaf. 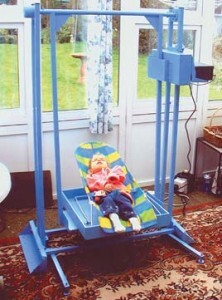 Her parents wanted a motorised hammock which could give a sense of movement and her carers wanted some relief from rocking her in her sprung cradle. The swing has a freestanding steel frame with out-riggers for stability which can be swung inwards when the swing needs to be moved. The child lies in her sprung cradle which is clamped in a wooden tray. The swing is powered by a vehicle windscreen wiper motor and a modified linkage with variable speed control. The child spends some time in the swing every day and smiles and appears to be happy. Her mother gets some relief from the continuous demands of this very disabled child.